St Matilta, a widow for thirty-two years, is recognised as patroness of mothers with disappointing children. 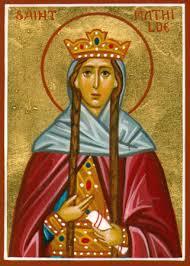 Matilda was married to King Henry the Fowler of Saxony, was generous to the Church and to the poor. When her husband died, she had difficult relationships with her sons and is recognised as patroness of mothers with disappointing children. Patrick Duffy tells her story. St. Matilda was born about 895, the daughter of Count Dietrich of Westphalia and Reinhild of the royal house of Denmark. She was raised by her grandmother, the Abbess of Erfurt, at her convent, where she developed skills in needlework and purposeful living as well a taste for prayer and spiritual reading. She married Henry, Duke of Saxony, called “the Fowler” because of his interest in falconry, who became king of Germany in 919. Henry encouraged Matilda to use the resources of his kingdom for works of charity. They had two daughters – Gerberga, who married Louis IV of France, and Hedwig, the mother of Hugh Capet – as well as three sons – Otto, who succeeded his father in 936 and became Holy Roman Emperor, Henry who became Duke of Bavaria, and Bruno, who came archbishop of Cologne. Immediately after Henry died in 936 Matilda called the priest to say Mass for his soul and at the same time took off all the jewels she wore and handed them over to the priest as a pledge that she would give up the things of the world from then on. She lived as a widow for thirty-two years. During this time she suffered ill-treatment from her son Otto, who was annoyed that in the election for king she favoured his younger brother Henry. Henry, called “the Quarrelsome”, revolted against his brother and also showed himself ungrateful to his mother. Both complained of their mother’s generosity to the Church and to the poor. Matilda reasigned her inheritance to her sons, and retired to a convent she had built. She died in 968 at the monastery at Quedlinburg where she had buried Henry, and was interred there with him.